I found the following article interesting and wanted to share it. Atlanta has been at the heart of controversy for the past year or so in regard to Confederate symbols and flags. Several years ago, the state was pressured into changing its flag so the Southern Cross was not as apparent. The NAACP talked about getting rid of Stone Mountain. And, of course, all those monuments were under attack. Now the great city of Atlanta is causing more controversy. A controversy in the city of Atlanta is brewing over the naming of a park in a “Black community.” Some are shocked that the city plans to name the park after a former mayor and Confederate officer, Major Livingston Mims. Mims served as Atlanta’s mayor from 1901 to 1903. The park development will cost an estimated $40 million and will include a statue of Mims alongside 15 other statues of Black local and national leaders and a Georgia Native American chief. Among these statues will be likenesses of noted civil rights leader Julian Bond and famed educator and leader W.E.B. Dubois. Surprisingly, the naming of the park has the backing of former Atlanta mayor and civil rights icon Ambassador Andrew Young, who reportedly engaged in a heated discussion with Atlanta NAACP President Richard Rose about the park. The media is doing back flips to get as many quotes out there from Rose but all published accounts of the Twitter and Facebook discussions between Young and Rose are deleting Mayor Young’s comments. I always enjoyed business-related writing and thought a non-fiction self-help book, with life-lessons I learned along the way, would be a fun project. But, as often happens when you put yourself out there, I discovered another path and took it: I developed the characters and stories for a TV pilot that is set in the fashion world of 1970s New York. As they say “Write what you know.” I’m a native of Long Island, and between attending school and working, I spent twenty-two years in Manhattan. At some point, I realized that the main character, Dana McGarry, needed more drama and the plots had to be developed, and I felt the best way to do that was to further develop the story in a novel. A Very Good Life, inspired by the pilot and first season, was published in 2014. . My new novel, What Might Have Been, is based on season two. What Might Have Been focuses on the personal and professional challenges of newly divorced Dana McGarry. Dana is a fashion buyer at one of New York’s most glamorous department stores, Dana McGarry is a tastemaker, her keen instinct for fashion trends and innovative ideas coupled with a razor sharp business sense. But like the elegant and conservative store that employs her, Dana is caught between two eras—between being liked and standing her ground, between playing by the rules and being a maverick. Dana is sensitive and beautiful, but what you see is not what you get. Behind the cool and attractive facade, Dana is both driven by her need to control yet impeded by her expectation of perfectionism. As she competes to replace women at the top of their game, she is challenged by jealous colleagues. And when a wealthy love interest wants to open doors and support her ambition, she embraces Coco Chanel’s mantra of “never wanting to weigh more heavily on a man than a bird.” As the women’s movement paves the way, Dana finds a path to the career she wants at the expense of happiness that will have to wait. Dana makes a difficult choice, and, as we all know, when we make one decision over another, there comes a time when we think what if, what might have been. What is your favorite character of your latest book? Since I tend to write cinematically, my style is descriptive. Since I am an Anglophile, my favorite authors tend to be British, and one of my favorites is Ian McEwan. I have an active business career, and discovered writing and creating just five years ago. I am working on the pilot script for the Dana McGarry series, and then will get to book three. If readers would like to see Dana and her story on the screen, I would so appreciate their comments in an Amazon review! Write what you know and love, and don’t worry about style and grammar. That’s why we have editors! Wow…difficult question. I’ll say Ian McEwan’s Atonement…. As a fashion buyer at one of New York’s most glamorous department stores, Dana McGarry is a tastemaker, her keen instinct for fashion trends and innovative ideas coupled with a razor sharp business sense. But like the elegant and conservative store that employs her, Dana is caught between two eras—between being liked and standing her ground, between playing by the rules and being a maverick. Dana is sensitive and beautiful, but what you see is not what you get. Behind the cool and attractive facade, Dana is both driven by her need to control yet impeded by her expectation of perfectionism. As she competes to replace women at the top of their game, she is challenged by jealous colleagues. And when a wealthy love interest wants to open doors and support her ambition, she embraces Coco Chanel’s mantra of “never wanting to weigh more heavily on a man than a bird.” As the women’s movement paves the way, Dana finds a path to the career she wants at the expense of happiness that was not meant to be. Lynn Steward, a veteran of the New York fashion industry and a buyer on the team that started the women’s department at Brooks Brothers, created the Dana McGarry series, set at a transformational time in the 1970s world of fashion and in the lives of multigenerational women. What Might Have Been is the second volume in the series. A Very Good Life, Steward’s debut novel, was published in March 2014. What? How is “Dixie” non-inclusive? First of all, the song was written before the Civil War. Second, it was written by a Northerner. Third, it was President Lincoln’s favorite song. Fourth, there is nothing in the lyrics that implies racism, which is what all these idiots are now claiming everything Confederate is. Fifth, Ole Miss should be ashamed of doing away with its unique, wonderful heritage. The University Greys were students from the school who went to fight in honor of the South. None of them survived. Their bodies were returned, and they were buried on campus. This is a great dishonor and tragedy, because whoever is in charge at Ole Miss is seriously missing the point. Instead of misrepresenting the history of this school, they should be embracing it. They’ve already replaced Colonel Reb and renamed Confederate Avenue. And they refuse to fly the Mississippi state flag on campus: the same state that funds them. I guess getting rid of the Rebel name and the Confederate soldier statue will be next, because who knows who that might offend. If I was an alum of Ole Miss, I would be very offended by what is going on, and I wouldn’t hesitate to let them know. Cutting off funding might get through to them. Shame on you, Ole Miss. Shame on your leadership for misdirecting the school. And shame on you for discrediting your history and categorizing all your Southern heritage as racist. Yesterday, it was announced that the chancellor of Vanderbilt University will erase more Southern history. This time, the attack is on an old building on campus that has the word “Confederate” embossed onto it. According to Chancellor Nicholas S. Zeppos (who is not Southern and does not have any Southern roots), removing the words “Confederate Memorial Hall” from a residence hall would inspire diversity and reduce racial inequality. Actually, what it will do is create more unnecessary political correctness. It is interesting that Vanderbilt acquires so much funding from taxpayers, and yet, somehow sees fit to destroy history without their consent or even knowledge. Zeppos seems to think changing the name is not rewriting history. Except that it is. Really? All that from one word? What about Southern heritage, pride, defense of one’s own home, and prosperity? And who exactly doesn’t feel welcome because of a name on an old building? A very small minority, if that? I have to wonder. Using a word like “pediment” is a sure indication of Zeppos anti-Southern sentiments. Like so many others driven by political correctness these days, Chancellor Zeppos obviously has not taken many history classes. Instead of changing the name, which would cost thousands of dollars, the building should be used as a learning tool. After all, this is an academic institution of higher learning, is it not? Erasing history is the biggest mistake anyone can make. And doing away with the name is offensive. I’ve been watching the Olympics every night since the opening procession last Friday night. It’s amazing to see these athletes perform, and Rio looks like an awesome place, despite some of the stories that have been circulating around about the water quality, security, etc. The Olympics were inspired by ancient games that were held in Olympia, Greece. In 1894, Baron Pierre de Coubertin founded the International Olympic Committee, and the first modern Olympics were held in 1896 in Athens. During the 20th and 21st centuries, the Olympics morphed into various other games, including summer and winter games, the Paralympic Games for athletes with disabilities, and the Youth Olympic Games for teenage athletes. Although the games weren’t formally established until after the Civil War, it’s apparent that Civil War soldiers, both Union and Confederate, had to endure trying circumstances that would have qualified them for athletic feats of skill. Not only did they have to march for 20 to 30 miles a day, but they had to do it barefoot to boot! (Pardon the pun.) And they had to tolerate all kinds of weather as well. They marched for miles on end, and at times, were immediately thrust into battle once they encountered the enemy. They had to be physically strong and adept at weaponry skills. Most of them were ordinary farm boys, some were immigrants, and a few were American Indians. All had the ability to withstand insurmountable odds. Last weekend, Fort McAllister State Park in Richmond Hill, Georgia, sponsored the Civil War Olympics. The event was meant to show how the Olympic Games have evolved over the centuries. Children were given the opportunity to throw a cannonball, which resembled a shot put used in olden days. They also played baseball according to the original rules of the game, participated in wheelbarrow races, rifle relays, tug-of-war, and horseshoes. All the participants who won an event received a gold medal. The PC police are at it again. It seems nothing is immune to what some would dub as “racist.” To me, that just seems like a convenient word to use for erasing our history. This is alarming, because if our history is erased, we have nothing to fall back on or to remind us of our mistakes. I received the following article last week and wanted to share. Let me know your thoughts on the subject. In the latest of seemingly unnecessary things that the government has its paws in, the Equal Employment Opportunity Office (EEOC) will decide if wearing the Gadsden flag creates a hostile work environment, punishable as racial harassment. The Gadsden flag comes from the Revolutionary War era. 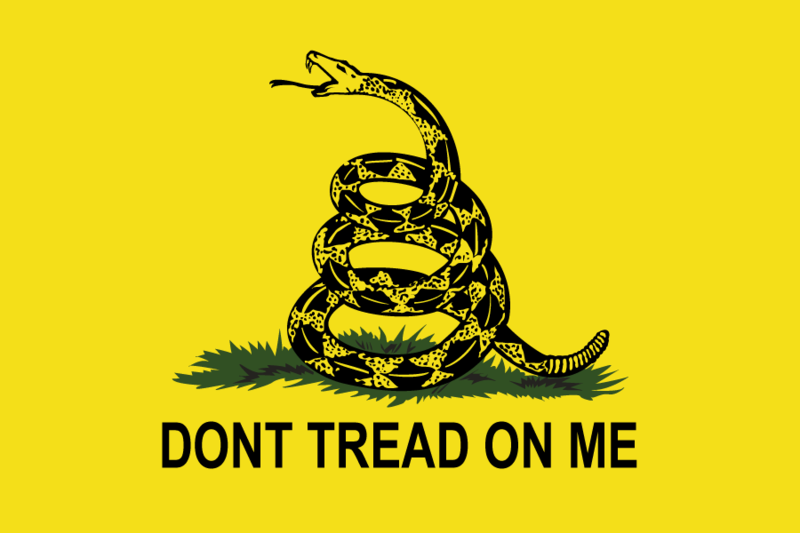 It is a yellow flag with the words “Dont tread on me” emblazoned on it, and a rattlesnake coiled up the middle. Most recently, it has become a banner of limited government advocates and the Tea Party. The issue of harassment stems from the creator of the flag, Christopher Gadsden, who was a slave trader. The Feds have admitted, regarding the Gadsden flag that,””it is clear that the Gadsden Flag originated in the Revolutionary War in a non-racial context..” The same is equally true of the Confederate Flag. And the Feds know that too! This is important because the Feds have just admitted that this has NEVER been about racism. It has been about erasing the history of our nation. Racism is just the vehicle of convenience that they are riding right now to get us there. The other goal is to turn a Christian nation into a pluralistic non-Christian nation. The code-word for that is DIVERSITY. So first it was Confederate symbols. Then it was the Founding Fathers. Now it is the symbols of the Revolution. If you can not bring an American Revolutionary Flag to work, or have a Confederate Flag on the truck that you drive to work, what if an employee came to work with a Trump/Pence bumper sticker? Or has a “Stop Illegal Immigration” sign on his cubical wall? Will these things too be considered racial harassment? Should the flag be ruled harassment, “all employers – private and public – where employees wear the flag could be held liable for workplace harassment if they receive complaints,” Fox News notes. There are so many misconceptions today about why the Civil War was fought, what motivated the South, and what the Confederate battle flag truly represented. Some people are wrongly offended by the flag because they don’t really understand what it symbolizes. I found the following letter interesting, so I wanted to share. Combine the current attacks against Biblical and traditional marriage, the attacks against all things Confederate, the attacks against all things Christian, and the attacks against all things constitutional and what we are witnessing is a heightened example of why the Confederate Battle Flag was created to begin with. Virtually every act of federal usurpation of liberty that we are witnessing today, and have been witnessing for much of the twentieth century, is the result of Lincoln’s war against the South. Truly, we are living in Lincoln’s America, not Washington and Jefferson’s America. Washington and Jefferson’s America died at Appomattox Court House in 1865. Instead of lowering the Confederate flag, we should be raising it. One of the largest flags in the country was hoisted last Saturday. Approximately 500 people witnessed the event. The flag, measuring 30 x 50 feet, was hoisted using a hydraulic crane. It has been raised just north of Danville, Virginia. The flag raising was in reaction to an August 2015 Danville City Council ruling, which stated that only the Stars and Stripes, the Virginia state flag, the City of Danville flag and POW/MIA flags could be displayed on city property. This ruling effectively banned the Confederate battle flag from being flown in public places. Since the ruling, fourteen Confederate flags have been raised around the area by Virginia heritage groups. The flag raising ceremony on Saturday included displays of artillery fire. Several people attended dressed in period attire. The event was sponsored by the Heritage Preservation Association, the Virginia Flaggers, Sons of Confederate Veterans and United Daughters of the Confederacy members, and Dixie Heritage subscribers. Another group, the South Carolina Secessionist Party, is searching for land to rent in order to erect Confederate battle flags all over the state. This is in response to the flag’s removal from the South Carolina Statehouse last summer. The group says it has received at least twelve offers of land to raise the flags on so far. Their goal is to raise $10,000 as well in order to raise the flags. So far, they have acquired about $550 via their Fundly.com page.